Test batches begin as a dream and can turn into a regular offering in a short period of time. After going through a short trial period of test batches, Fort Collins Brewery finalized its recipe for a new brew - Hoptitude Imperial Extra Pale Ale. They were looking for something to replace their retired Incredible Hop beer seriess, but in a single regular offering. Read the press release issued this week for more info on their latest offering. [PRESS RELEASE] (Fort Collins, CO) – The Fort Collins Brewery, maker of Rocky Mountain IPA and Chocolate Stout, is releasing a new seasonal beer in April. The new brew, Hoptitude, is a strong but surprisingly easy drinking Imperial Extra Pale Ale. FCB created two pilot batches with varying malt and hop bills, which they called Test Tube #1 and Test Tube #2, and got feedback from patrons of their Tasting Room. Test Tube #2 emerged as the more popular version among voters, and the FCB team feels it is the more appropriate of the two for a warm weather seasonal. Thus, with some slight tweaking of Test Tube #2, Hoptitude was born. The FCB team says this is beer with attitude and altitude; appropriate, considering its origin in the vibrantly individualistic town of Fort Collins in the Front Range of the Rocky Mountains. 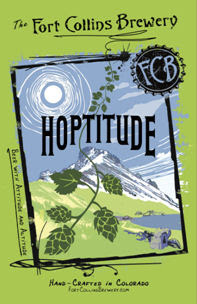 Hoptitude will be released in the FCB Tasting Room on Friday, April 12th. Aside from getting to try this new addition to the FCB family, patrons can win discounts on the new Hoptitude stainless steel growlers and t-shirts if they come by between 11am and 7pm. Beyond the walls of FCB, Hoptitude will be available in 4-packs and draught in most of the 17 states in which it distributes. Hoptitude description: What’s better on a warm day in the mountains (or at sea level, for that matter) than relaxing with a strong beer that drinks easy? Hoptitude has an aromatic orange rind nose courtesy of a late addition of Pacifica hops from New Zealand, a bready malt backbone, a refreshing hop flavor reminiscent of dry grapefruit, and a palate cleansing finish. - March 2013 brings new releases for The Fort Collins Brewery. - Fort Collins Brewery Tap Club get a revamp.